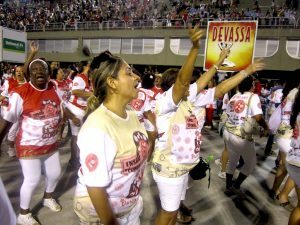 RIO DE JANEIRO, BRAZIL – As Carnival approaches, each samba school in the Grupo Especial (Special Group) is given the opportunity to rehearse their parade on the avenue of the Sambódromo, the grounds of the world-renowned competition. Not only does this allow valuable practice time for the performers, it also provides an entertaining show for any spectators who may want a taste of the Carnival spirit for free. Salgueiro samba school rehearses at Rio's Carnival Sambódromo amidst a crowd of spectators, photo by Evelyn Erivwo. Heather Silva Frinell, an American expatriate living in Rio, is parading this year for the first time with samba school Imperatriz, as part of Ala (section) fifteen. The Sambódromo, possibly one of the most iconic constructions in the city, was originally built by renowned Brazilian architect Oscar Niemeyer in 1984. It is currently under renovation to be ready just in time for Carnival 2012, with an increased capacity to now hold 90,000 spectators in total. The expansion was in response to the parades increase in grandeur, and also to accommodate the 2016 Olympic Games ceremony. Beija-Flor de Nilópolis samba school technical rehearsal, photo by Marina Herriges/Riotur. Also in agreement is member of The American Society of Rio de Janeiro (AmSoc Rio), Vanica Royster who will take part in Salgueiro’s procession along with some of her fellow society members. Both Frinell and Royster do, however, point out that anyone hoping to watch the rehearsals as a substitute to the actual Carnival parade may be left disappointed since the fabulous costumes that personify Carnival are absent. Nevertheless, for those who are new to Carnival or simply want to get in to the spirit of the festivities, catching a technical rehearsal at the Sambódromo is certainly worth the trip. The next, and last, set of technical rehearsals scheduled to take place at the Sambódromo will feature Mocidade and Salgueiro on Friday, February 10th, Portela and Imperatriz on Saturday, February 11th, and Beija-Flor on Sunday, February 12th. 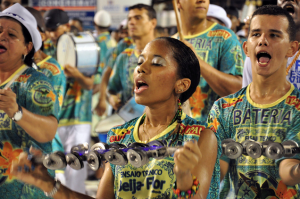 To find out more, visit Rio’s official Tourism site for Carnival 2012.